An Open Letter from ANC Scotland (the Scottish branch of the Catalan National Assembly). 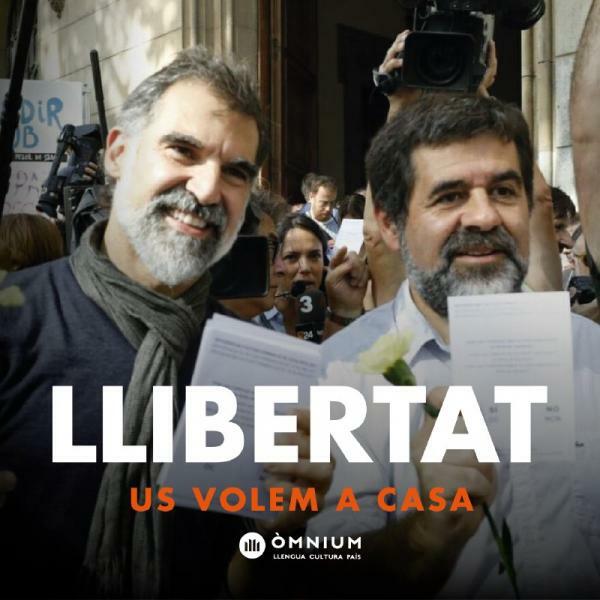 On the evening of 16 October, the presidents of the Catalan National Assembly (ANC) and Òmnium Cultural (ÒC), the two biggest grassroots organizations fighting for independence and self-determination for Catalonia, were sent to prison, accused of sedition because they organised demonstrations to protest the detention of Catalan government officials. The two prisoners have been responsible for some of the most impressive rallies and demonstrations seen in Europe, which have always been peaceful. As Catalans and as ANC Scotland, we think that their imprisonment for political reasons is absolutely unacceptable and we demand their immediate release. This is no longer only about ‘yes’ or ‘no’ to independence. This is about millions of citizens peacefully asking for self-determination and a state rejecting any idea of dialogue because of its Francoist roots. This is about democracy and freedom of speech, and the right of every citizen to defend their ideas peacefully without being repressed for them. The Catalan government has repeatedly tried to open a dialogue, and many offers of mediation have been made, but the Spanish government remains hostile and insists there is nothing to discuss. After violence by the state against peaceful citizens during the referendum, and now the taking of political prisoners, it is time for the friends of Spain across Europe to speak out and call her back before she goes further down the route of repression. If you enjoyed this article and want Bella to survive we need your support. A free Scotland needs an independent media, that can’t exist without your support. Please donate to our annual appeal here. Thanks. Good luck, Catalans! I wish you Free Independent Catalonia! Please let me know about any events/protests/petitions in support for the Catalan Nation. Regards from a Croatian, based in London! The Spanish Government are showing that they would march the Catalans into the gas ovens as readily as Germany in the, 1930s. And the EU stands idly by. So remind me please what the EU stands for. Just read the reports that the Polish EU President Donald Tusk has issued that statement that the Catalonian crisis is not on the agenda. Absolutely fantastic response from a man whose country was invaded by the Nazis in 1939. The Poles didn’t like that in 1939 and in 2017 neither do the Catalans who are having direct rule and political incarceration imposed on them. Tusk must indeed have fond memories of the gas chambers and fascist rule because no one forgets these things, least of all prominent politicians. Except, they are not Political Prisoners. They are being held awaiting trial. The charges are based upon their directing protests which obstructed Police, and led to damage to public property. When self appointed people, obstruct the judicial system they are not Political Prisoners, but liable to arrest. Time, will decide if they were Mandela like martyrs, or simply Rabble Rousers. I think by ‘self-appointed’ you mean ‘elected’, don’t you?